We have the honor to release for free the first posmodroomic compilation inspired in the work of F.I.N. & (((O))) from long years ago until the current present and we’re sure that their will give it to the future. 5 year ago we call ourself as postmodernist doom and with the time, (((O))) from mexico was the first who add to this 3 years ago. We do and Feat/Lp called “El ciclo de la Impotencia de la Conciencia” and we call that sound posmodroom. After that new bands are add to this and work for make growing this unusual shape of music. Bands as No Heaven (France), Frustration Emotions (Chile) and Overhaul In Damnation (Singapore) was the first support on it. Now, FunerART left they condition as label and are redefine herself as an art collective for bring a good support to the “posmodroomic vision”… For that, their new name is FunerART posmoGROUP. They are released a very great compilation called “posmodroom: the last days of modernshit” that contain only support from 26 posmodroomic artist from the world. Thanks to all the bands that appear here! Thanks to all and to you by the GREAT SUPPORT ON ALL TIME!!! Open Call to all the artist of the world. Asi es! 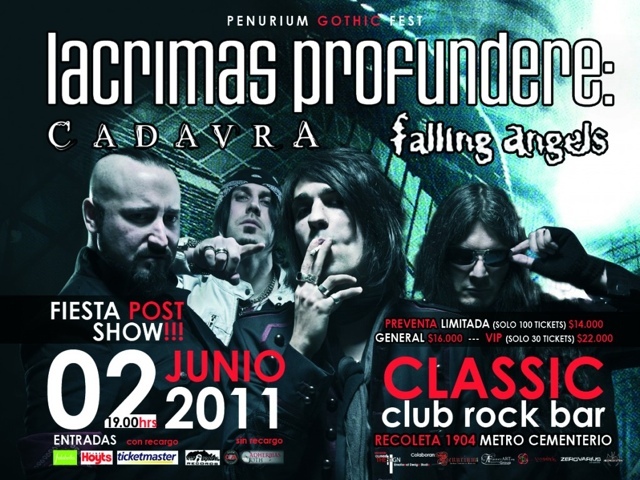 Con orgullo comunicamos que nuestras bandas de corte dark y gothic Cadavra y Falling Angels han sido invitadas al PENURIUM GOTHIC FEST 2011 a realizarse en el centro de enevtos San Diego! Este festival tendra como plato fuerte a los alemanes de Lacrimas Profundere y lis debutantes de Inhibidor. Será una noche única y de encuentro con los maestros alemas de Lacrimas Profundere, a quienes amamos y respetamos mucho en Chile. of the postmodernist doom, if you are ine, you are here! AOE is a one man project founded by Jef Janssen in Diest, Belgium. It’s music can be described as a mixture between neofolk and darkwave: grounded on acoustic guitars, combined with dreamy or dark synths and whispering, haunting vocals. Sometimes dark romantic, sometimes apocalyptic. Always nature-loving, always driven by melancholy. posmo-creation is overall; search your band here! Follow us! The Grave is Open!